The Stringvision Bowgrip is a bow frog covering with a thumb indent. The advantages are primarily ergonomic (anti-fatigue), but the Bowgrip also offers protection to the bow and instrument. 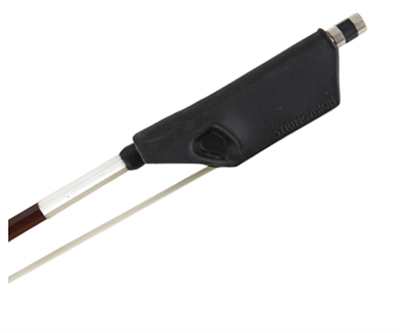 The Bowgrip fits over all sizes of violin, viola, and cello bows, including most fractional size bows. The Bowgrip allows the string player to grip the bow with a lighter touch, alleviating tension and resulting in far less hand fatigue. The thumb indent allows for secure and comfortable placement of the thumb. the Bowgrip will serve to protect the bouts of the instrument from minor nicks. The Bowgrip slides/stretches over the frog fairly easily without removing the frog from the stick. The Bowgrip is non-latex and FDA approved.